I’ve not minced my words when it comes to the fact that I will always have a big ole’ soft spot for my former stomping grounds. Besides the people – my fabulous friends, hysterical co-workers, the curious and strange souls, and even the sweet coffee-cart-man on 48th and Park who had my morning cup ready and waiting every day just the way I like it (large, with a generous tip of cream) – the thing I find most enticing about that great big city is the food. Being as interested in cooking and eating as I am (yes, I do loathe the term ‘foodie‘ and will continue to avoid it at all costs…. **shudder**), I am massively lucky to have ended up in Boulder. For a city that takes up only a small sliver of the size of New York City’s giant and jumbled pie, there has been an answer – and an amazing one at that – to every one of my old favorites. Lights out bakeries, small meticulously curated restaurants, white tablecloth service, excellent vegetarian, killer Neapolitan pies, craft breweries, impossibly fresh seafood, and food trucks galore….my little city of one-hundred-thousand does a bang-up-job when it comes head to head in comparison with my old playground – a playground that contains, arguably, some of the best food in the world. However there are some things that are so unique to a certain place, there is just no amount of re-creation, re-imagination, or re–anything that can be done to properly replicate them, and, to be frank — you wouldn’t want to. There are a thousand rotating reasons I will forever have to be excited for trips back to New York, and if I had access to all of each and every one of those things, well…. 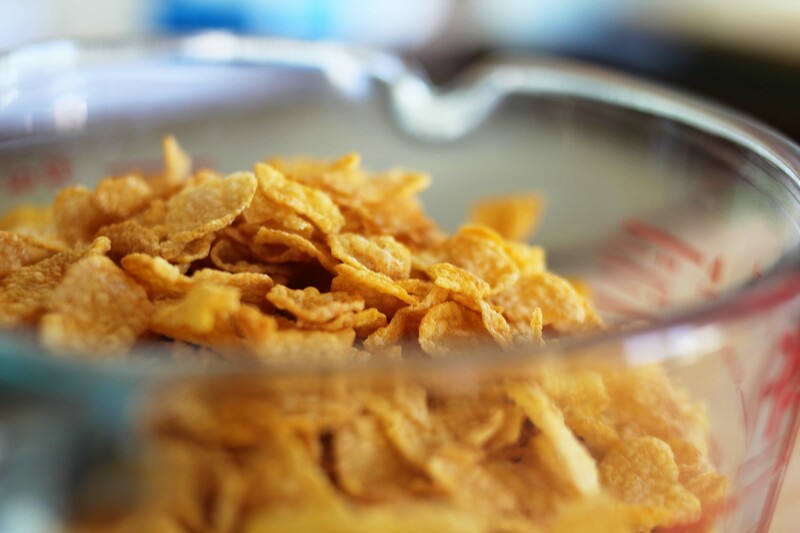 But there are a few things….a few small, round, crunchy and delightfully chewy things that I am oh-so-happy I can whip up on my own. 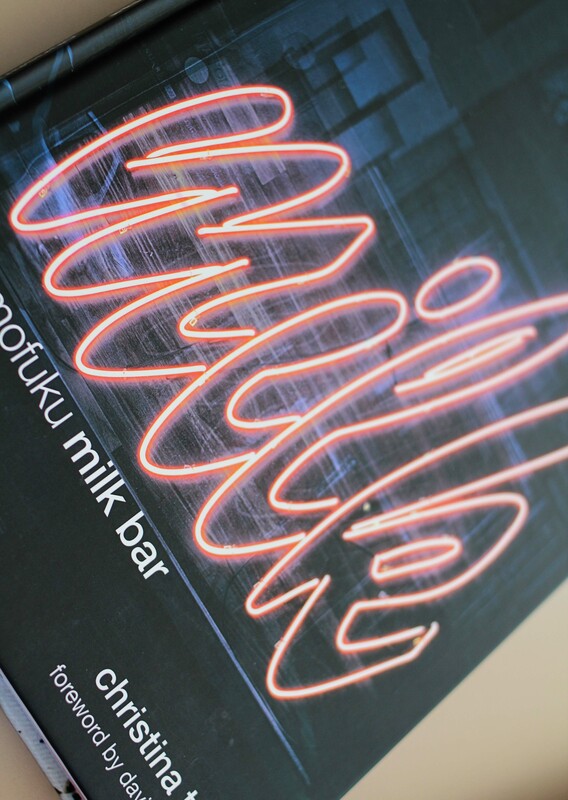 When one of aforementioned fabulous friends (Mary) drops a package in the mail that contains a little piece of aforementioned food in mailable format (The Momofuku Milk Bar Cookbook), I am not going to be in any position to refrain from trying to make everything that the outrageously quirky bakery stocks it’s shelves with. 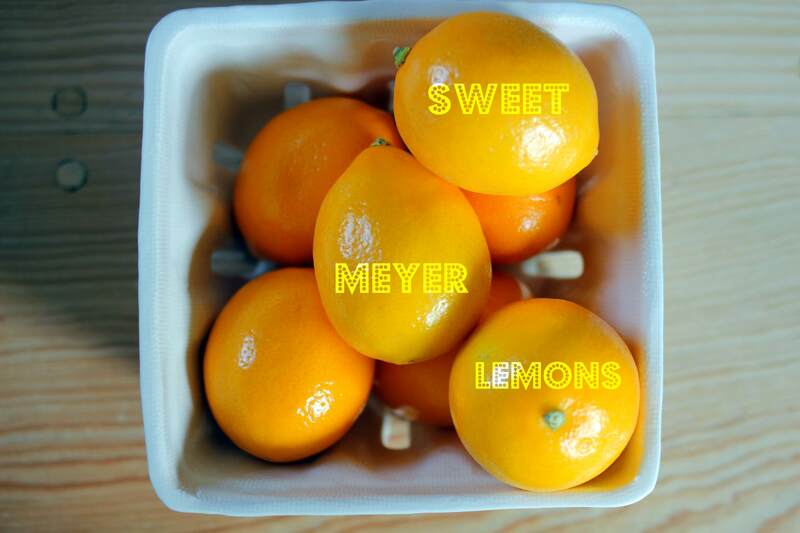 Fire up some beachy tunes, grab some meyer lemons, and make ice cream — obvi!! I’ve been thoroughly enjoying our weekends in the mountains and must admit that when you live somewhere that you can actually take advantage of all of this snow – it’s rather nice. Back in New York, a big snowfall was a week-long-at-least death sentence that meant mucky black sidewalks and the certain demise of the hemlines on all of your pants. Out here in Colorado, that same snow manages to keep it’s pristine achromatic hue for more than just the first-freshly-fallen fifteen minutes, and there are actual things to do here which cheerfully center around it. Things that involve being outside, and that are actually fun. But all the while that I am truly enjoying this Winter, I wince each time I catch a glimpse of my pale legs, and it would be nice to wear a white blouse again….without being mistaken for a friendly little ghost. Three years ago, my now sister-in-law came over to our itty-bitty twenty-second floor apartment in Greenwich Village to share presents and enjoy an early Christmas dinner with us. In our teeny galley kitchen we were balancing plates and juggling the ingredients for the proper three course holiday meal, that I can still remember as clearly as if it were yesterday. Back when co-habitating in ‘sin’ in that very first apartment, when it came to elbow room in the kitchen — we weren’t working with much (and even that’s being generous). For if you opened the oven door whilst standing in the teeny galley setup, you became trapped inside all of it’s steamy minute-square-footage glory, and fuggedabout about opening the fridge or dishwasher if you had kitchen company – the space allowed for operating strictly on a one-in-one-out basis. Even so, we were not deterred in our mission to host a lovely holiday meal. I had set the cheese plate (carefully curated by moi) teetering out on the living room chest that not only held extra blankets, but moonlighted as our dinner table. I had perfectly balanced the salad bowl atop the toaster oven to stand in waiting until his turn, and had seared the lamb chops that we had splurged on from the local butcher on a grill pan after marinating them in rosemary and garlic. I had baked a lemon cake earlier that afternoon which we nestled amongst bottles of red on top of the fridge, and there was a melange of sweet potatoes and cream simmering on the back corner of the stovetop. All in, I thought a far more sophisticated menu than our set-up alluded to. Of course nothing can be that perfect when you are twenty-five and still navigating the mostly yet uncharted waters of domesticity – in a shoebox, no less. I, the uber-excited-host, lost track of time while sipping white wine and chatting up our guest, leaving the potatoes to simmer down to something less ‘melange‘ and more ‘morose.’ I neglected to think about washing and ironing our new linen napkins, leaving them perma-creased and rough enough to take the skin off your chin with one swipe (nevermind that said napkins were light pink – more Easter than Christmas, but a minor detail, no?). And finally halfway through chop-searing, our pesky fire alarm decided to sound off, reminding us for at least ten solid minutes that it was smoky in our tiny abode. As if we couldn’t already tell. However in the end, our little dinner was perfect. Despite the melange making it’s way straight to the gar-bage, the lamb chops were perfectly cooked and the cake was light and lemony – I suppose all things considered the main course and dessert are the two most important components at the end of the day anyway. 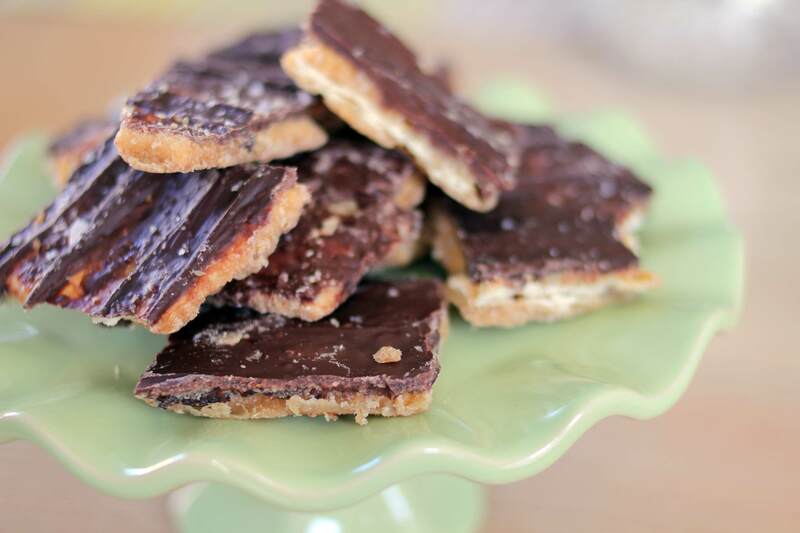 But what really stood out that night was a most curious looking little bag of treats that my future-sister-in-law had brought with her – jagged little toffee-brittle looking cookies that she insisted were very simple to make. After inhaling no less than 5 extra large pieces (and at least 3 more at the end of the evening while I finished scrubbing aforementioned grill pan) I was completely hooked, and intrigued. What were these things?? 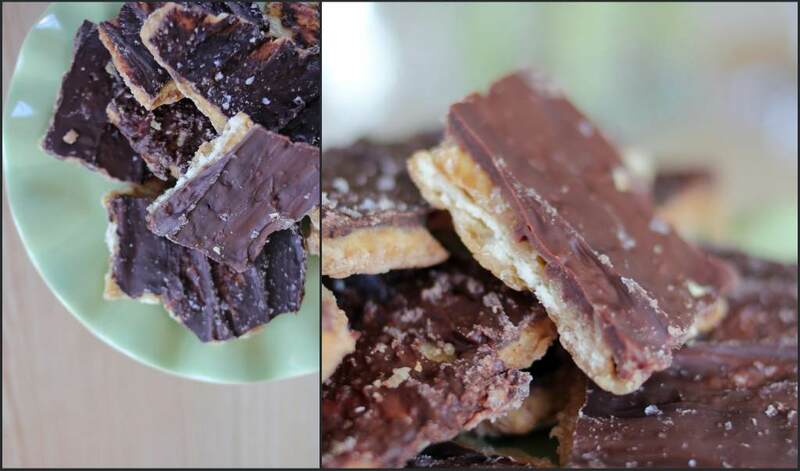 From outward appearances I could deduce that there was a cracker – a saltine even – involved as the bottom layer, with a layer of bittersweet chocolate blanketing the top. The middle had some sort of magical salty-sweet caramel holding it all together, that had seeped through and around the crackers, crusting up inside of all of the holes and transforming them into something otherworldly. After a bit of internet sleuthing, I came upon a recipe on Smitten Kitchen that fit their description perfectly: Chocolate Caramel Crack(ers) where Deb lovingly refers to them as ‘crack‘ both for the crackers, but also for the more sinister and addictive stuff that they liken themselves to as you uncontrollably go back for thirds, fourths — and fifths. 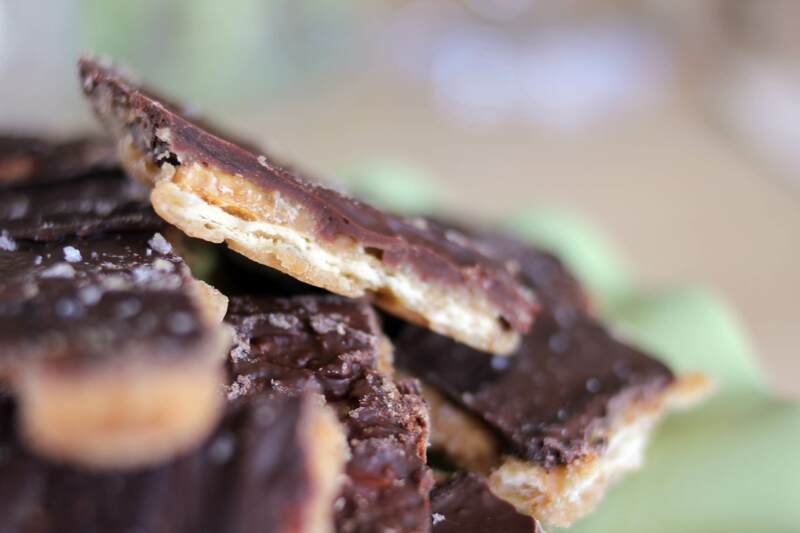 These are soooo sinfully good – they taste like a souped up hybrid of a Twix bar and a Heath bar, but still retain that homemade edge and goodness that any of that store bought junk just can’t hold a candle to. One look at the butter and sugar content and undoubtably you will be scrambling for your sneakers and gym pass, but let’s just shelve those thoughts until after the holidays, shall we? 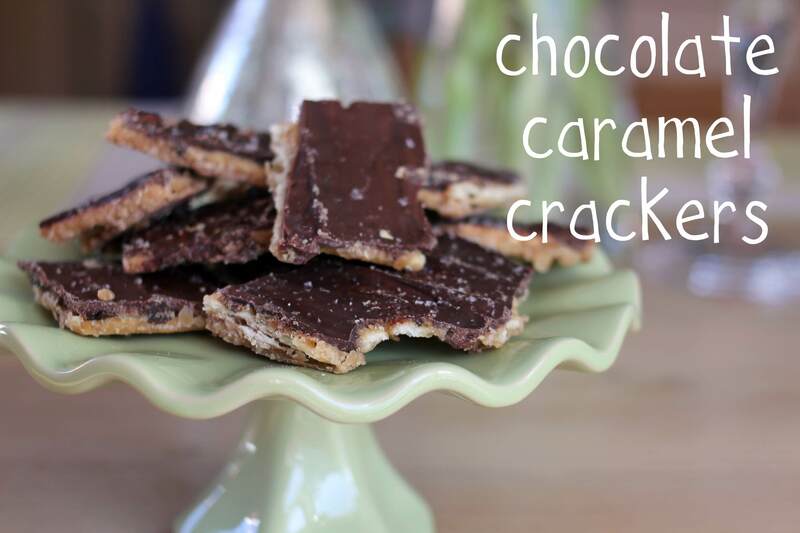 These cracker/cookies are so, so easy to make with things that most pantries are already stocked with – brown sugar, butter, saltines, and chocolate chips. 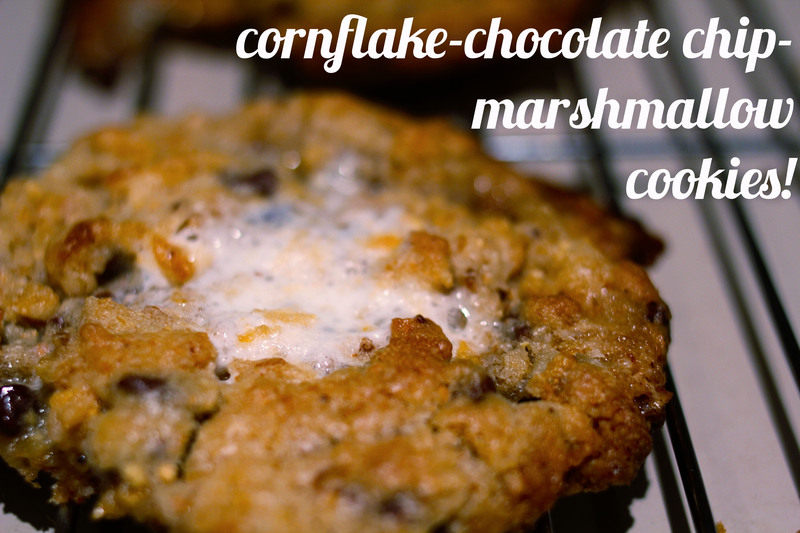 With something so insanely good coming from something so simple, this is a great recipe to have on hand for impromptu gatherings or holiday cookie parties when you already have too many other things on your plate (late holiday shopper who?) 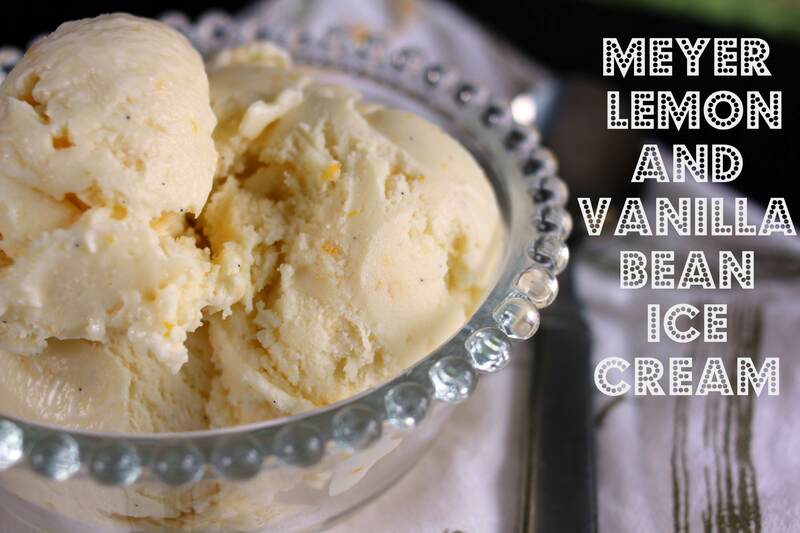 or just want to make something really decadent, really fast. 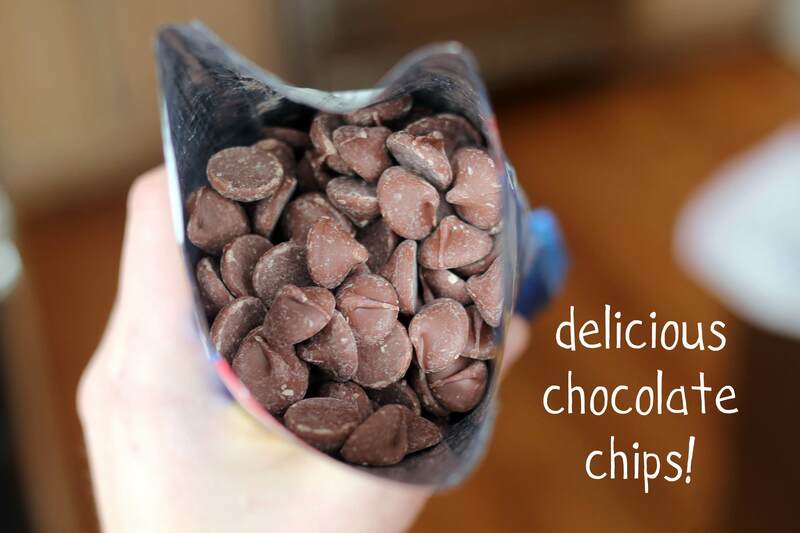 Make these today – you’ll thank me tomorrow! Preheat the oven to 350°F. 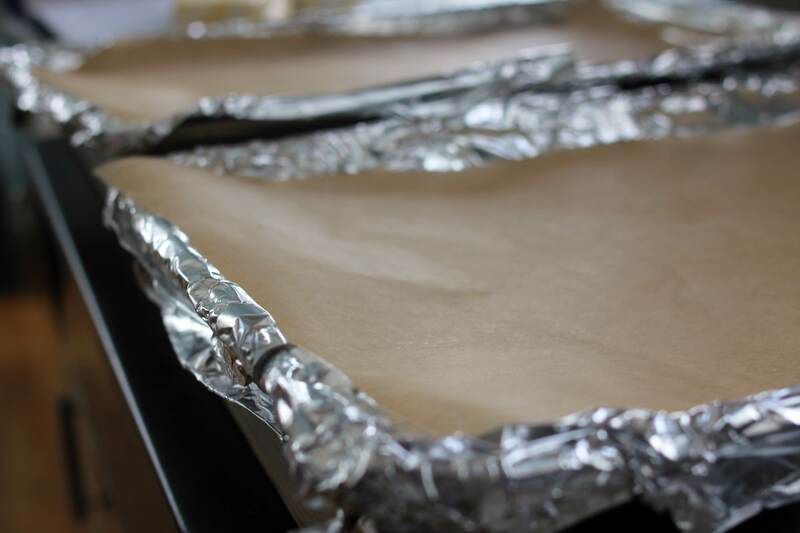 Line an 11-by-17-inch rimmed baking sheet completely with foil, and then line the base of the foil with parchment paper, cut to fit in the bottom of the pan. 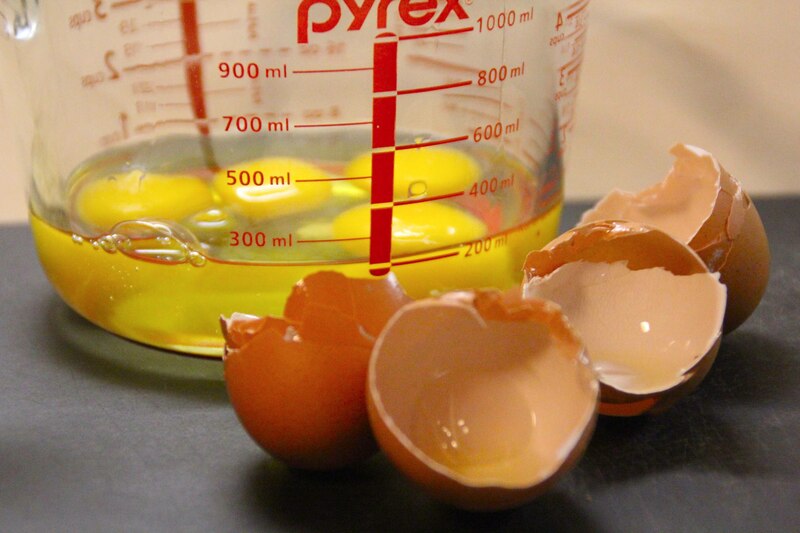 The parchment is key, as it will prevent sticking (and this is sticky stuff). 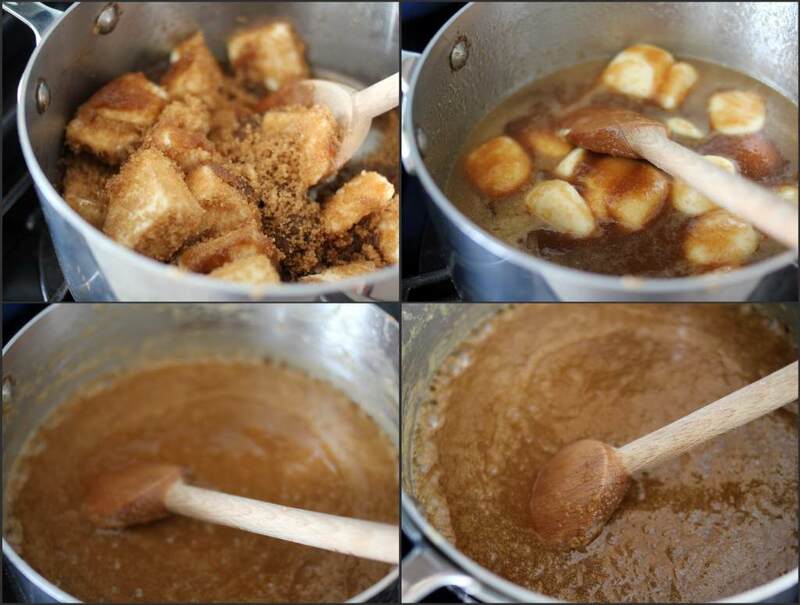 In a medium heavy-duty saucepan, melt the butter and brown sugar together, and stir it over medium heat until it begins to boil. 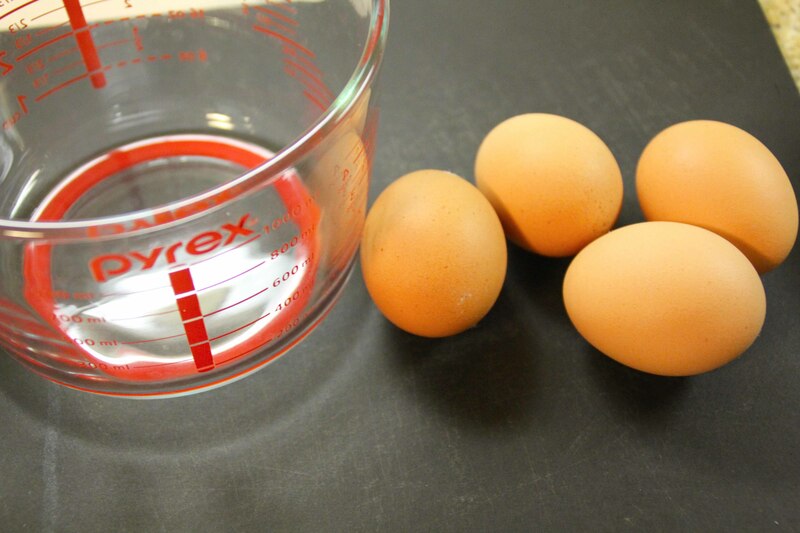 Once it has begun boiling, let it bubble for three more minutes, stirring it well the entire time to prevent burning. It will thicken a bit as it cooks. Remove it from the heat and stir in the salt and vanilla, and then quickly pour the mixture over the crackers or matzo. 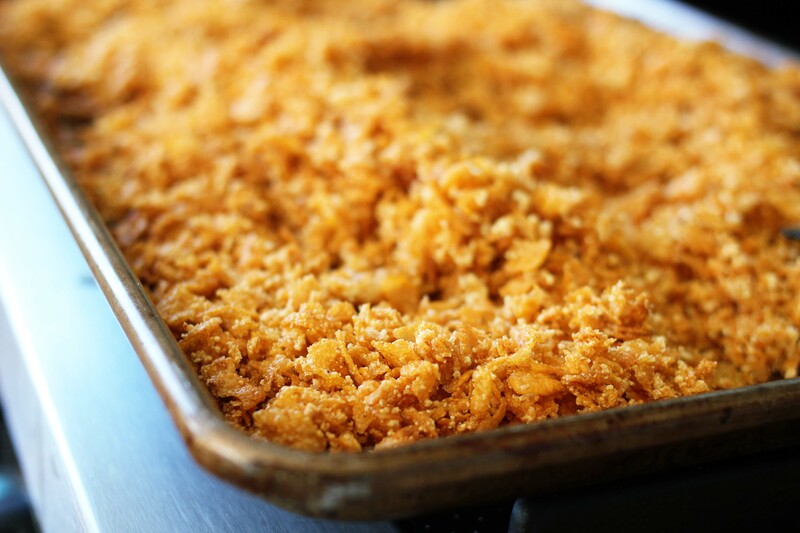 Spread the mixture quickly over the crackers to cover the entire surface area of crackers. Do this quickly, as it will begin to set and harden quickly. 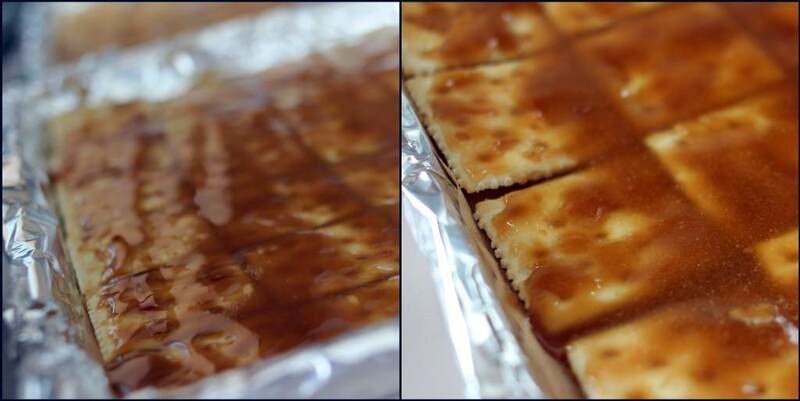 Bake the caramel-covered crackers for 15 minutes, watching carefully as it will bubble and the corners might darken too quickly and/or burn — reduce the heat if you see this happening. 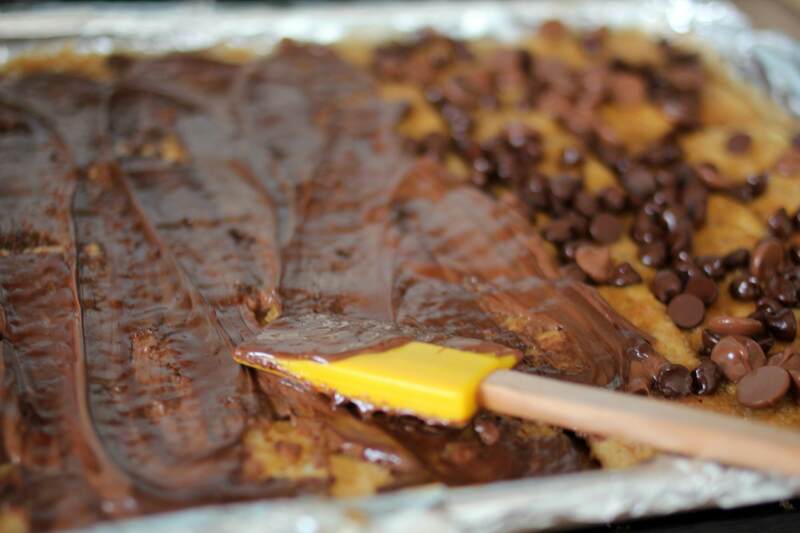 Remove from oven and immediately cover the baked caramel crackers with chocolate chips. 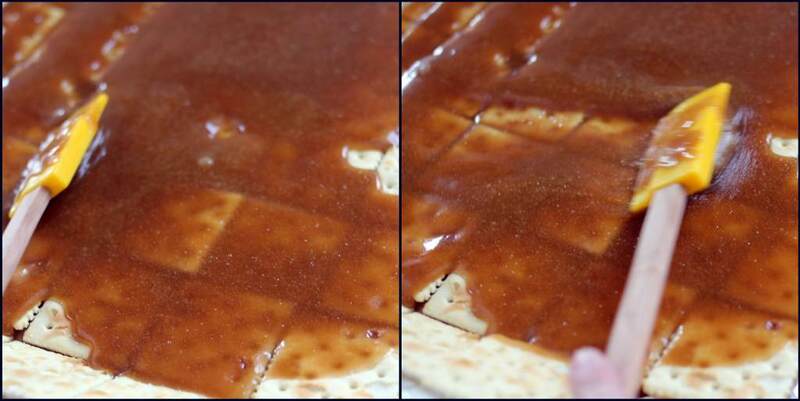 Let it stand five minutes, and then spread the chips evenly across the caramel – they will be melted and it will be surprisingly easy to do so. Sprinkle the surface with a bit of sea salt (but also remember Saltines are already salty & Matzo is not, so use more salt if using Matzo // less if using Saltines, depending on how salty you like things). 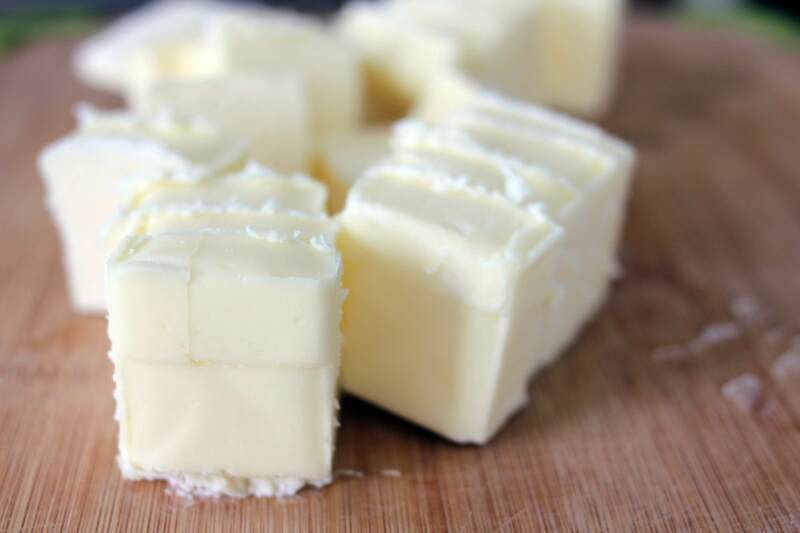 Once completely cool (this can be sped up in the fridge, or if you are like me, out on the deck on a cold December Colorado morning), break the sheet up into pieces and store in a ziplock or plastic container in the fridge. It will keep for at least a week in the fridge. These are the types of things that keep an adolescent girl up at night, and inevitably I’d be torn. 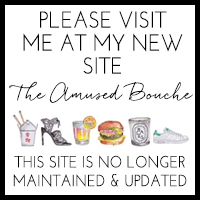 These days, my dilemmas have thankfully moved past cringe-worthy and clunky-soled shoes; however I still find myself cruising through boutiques and agonizing over frocks for friends weddings or impractical heels for parties. Without fail, after going home and letting the dust settle, I can only ever really remember one or two standouts and know immediately that those are the pieces meant to live in my closet. Recipes, though not exactly congruent with a frighteningly priced pair of this season’s boots, tend to have a similar effect on me: I’ll dog-ear cookbooks and magazines and bookmark blogs where I see things I just must make and then……totally forget about them. Except that is, for the few standouts that cut through my recipe fog and into the clear place where they take their place in line. 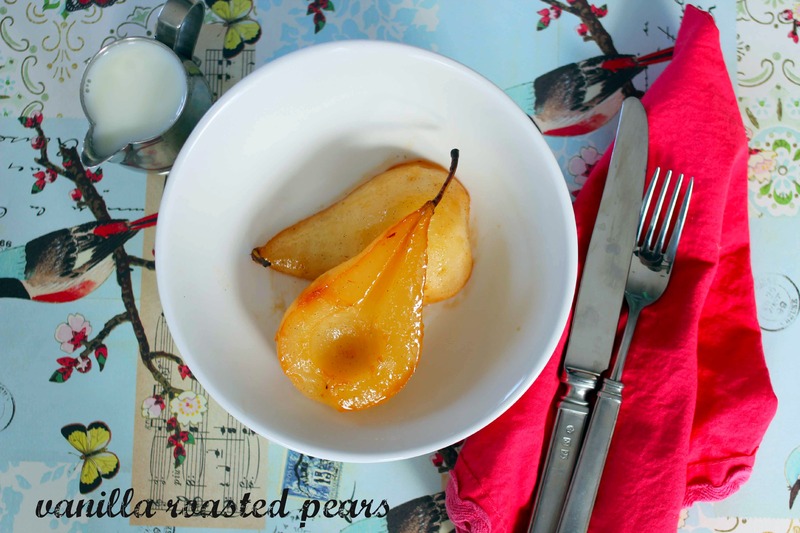 These Vanilla Roasted Pears hold such a distinction, and after drooling onto my mouse whilst reading about them on Smitten Kitchen almost two years ago (! ), I am still thinking about them – especially now that pears and all things roasted and vanilla sound just delightful. It’s embarrassing to admit that it took me that long to get my act together and make these. As Deb points out, it’s more of an approach and less of a recipe, and involves less effort than watering your plants. 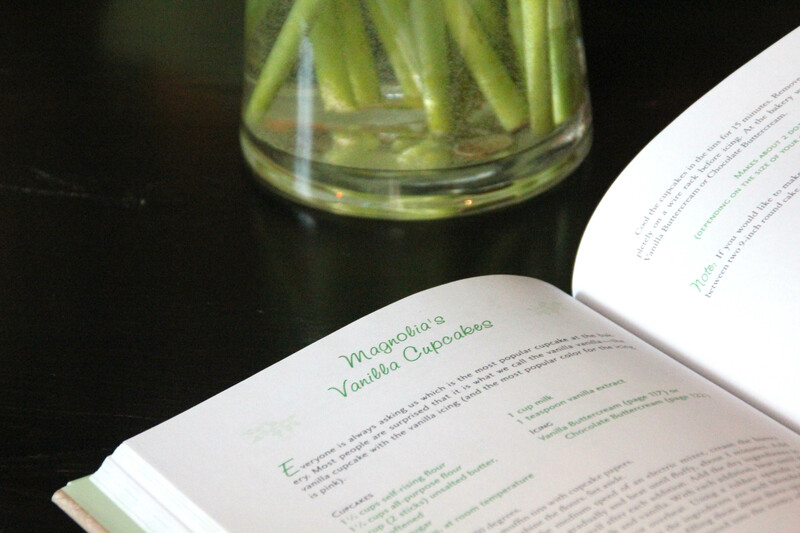 (Which, I am also embarrassed to admit, I often forget to do on a weekly basis – withering basil leaves be damned!) Essentially you chuck some peeled and halved pears in a pan with a bit of lemon juice, sugar, butter and half of a fresh vanilla bean – right there how can you go wrong? – and then roast the whole mess until the pears are soft and uniform in texture. The pear juices do this magical thing with the sugar and butter and come out on the other side of the roast having made a thick, luscious, caramelly sauce that I unabashedly and (once again embarrassingly) tried to eat with a spoon directly out of the oven, only to dribble it down my chin and burn myself. Do not be fooled by the simplicity of these, and do not, please oh please do not overlook them even if you think you might not love pears. 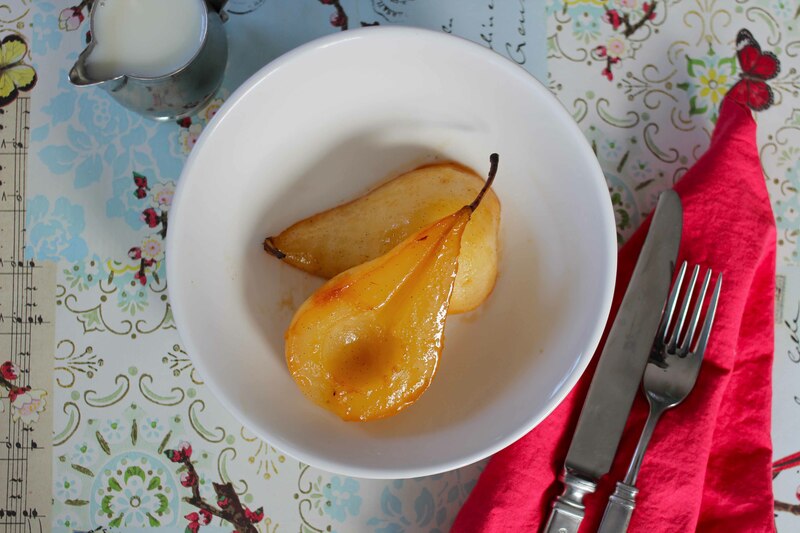 In my experience, this preparation takes even the pear skeptic (ahem, le husband) and leaves them reveling in its simple deliciousness. 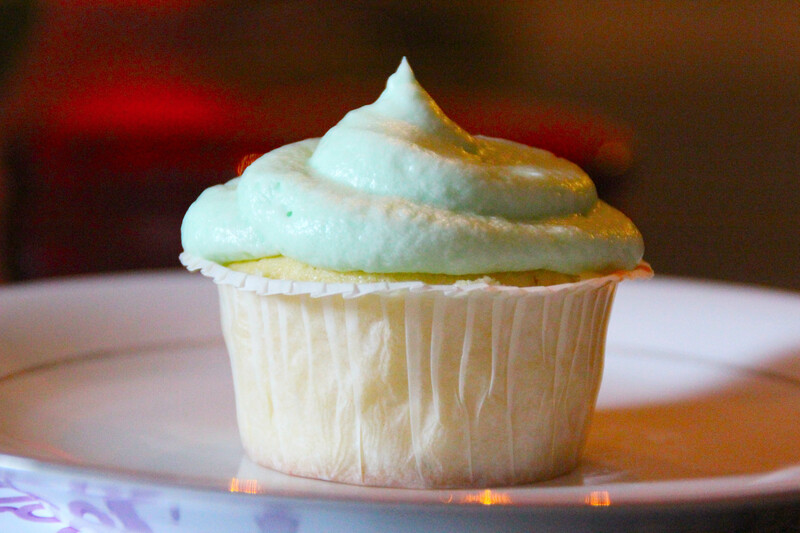 The fact that your house smells a zillion times better than any vanilla candle could ever hope to come close to is just an added bonus, and one that caused even the Puglet to hang around the oven, sniffing expectantly at it’s fragrant seams. 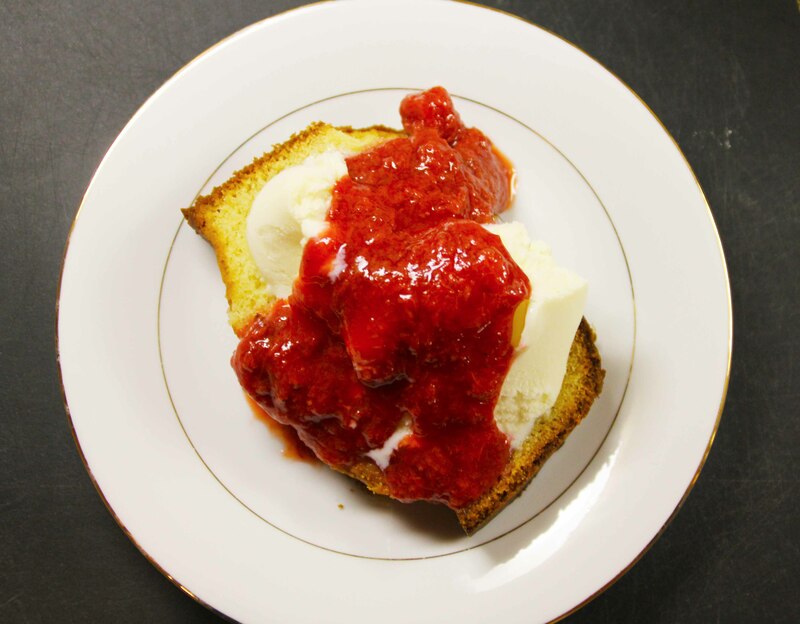 This is an ideal light dessert for a luncheon but is also special enough for the holidays or dinner parties, when paired with some good ice cream or lightly sweet custard. The leftovers (if you’re crazy enough to have any) gussy up plain oatmeal and I also suspect would taste delicious diced up and served with some good cheese. I followed this recipe pretty much exactly, using some of Deb’s advice (coring the pears & splitting the vanilla bean into smaller pieces). It is honestly foolproof – chuck the ingredients in the pan, and in 45 minutes or so you have a house that smells insane and pears flecked with vanilla bubbling in their own caramelized juices. 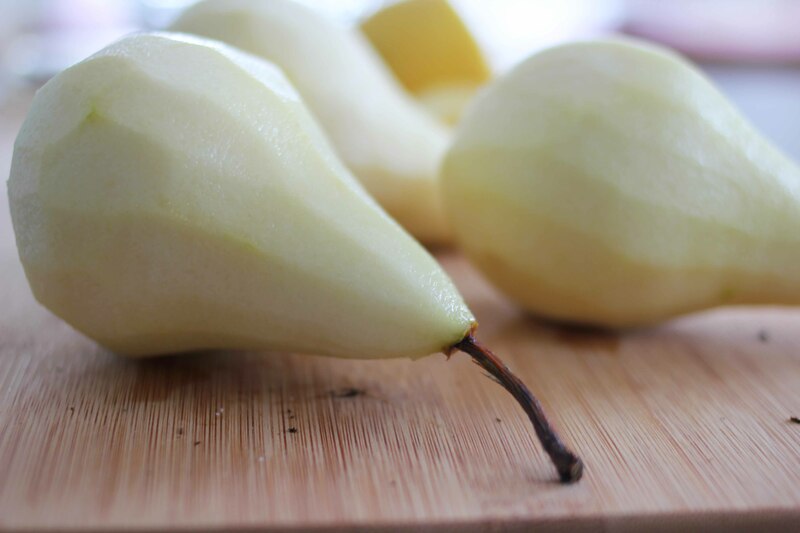 Sally Schneider at The Atlantic recommends to use slightly underripe pears, and I think thats great advice; pick some on the firmer side to avoid any that are mealy or overly sweet. Preheat oven to 375F. 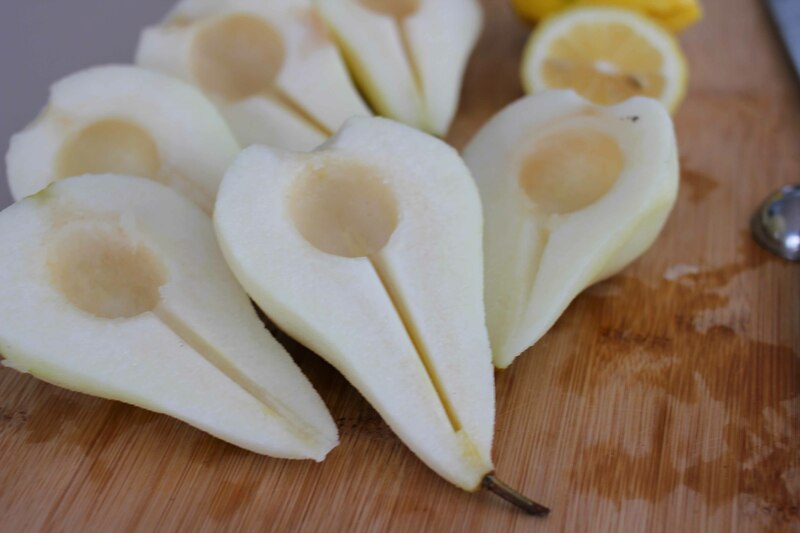 Peel the pears, and halve them vertically through the stem (keep the stem attached to one half of the pear, just for its cute looks – we like cute). Scoop out the seeds with a melon baller or small spoon, and remove the slightly woody core with a paring knife, if you’d like (I like this step, recommended by Deb, not Sally, and simply cut a little ‘V’ out of the center where the stem/core runs as you can see in the pictures above). 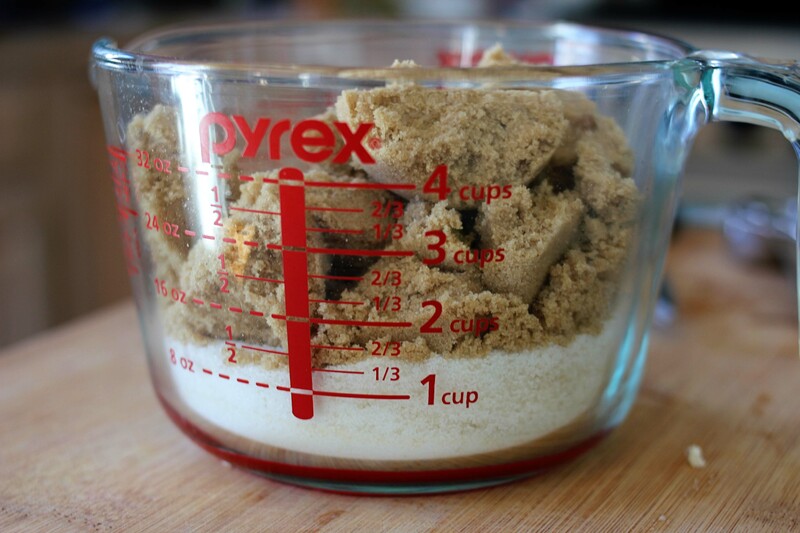 Place the sugar in a small bowl. 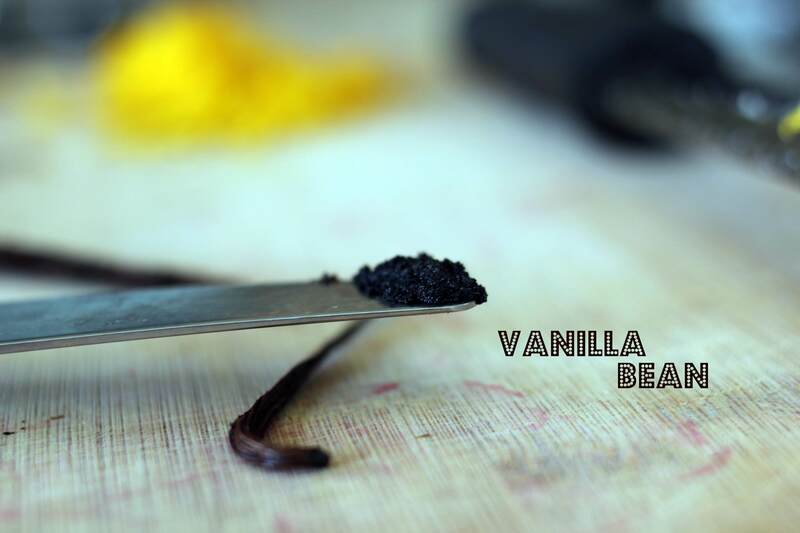 With a thin, sharp knife, carefully split the vanilla bean lengthwise in half and scrape out the seeds. 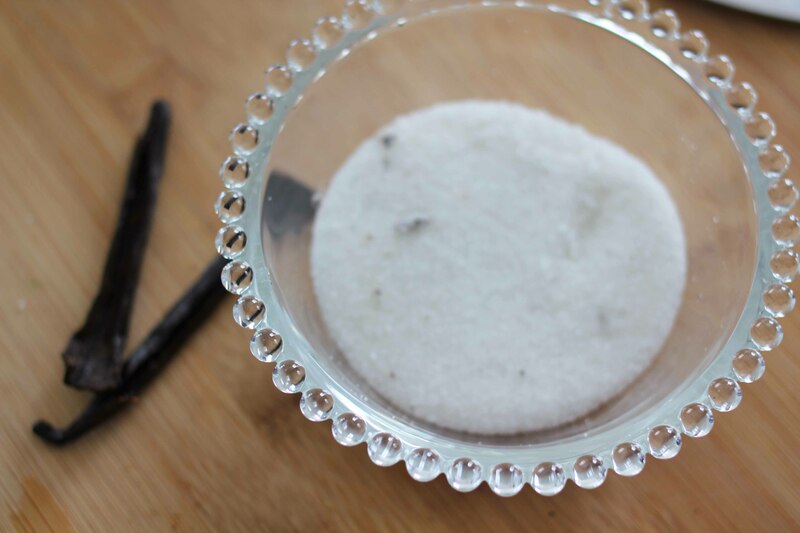 Stir the seeds into the sugar until the sugar is flecked with the little black seeds. 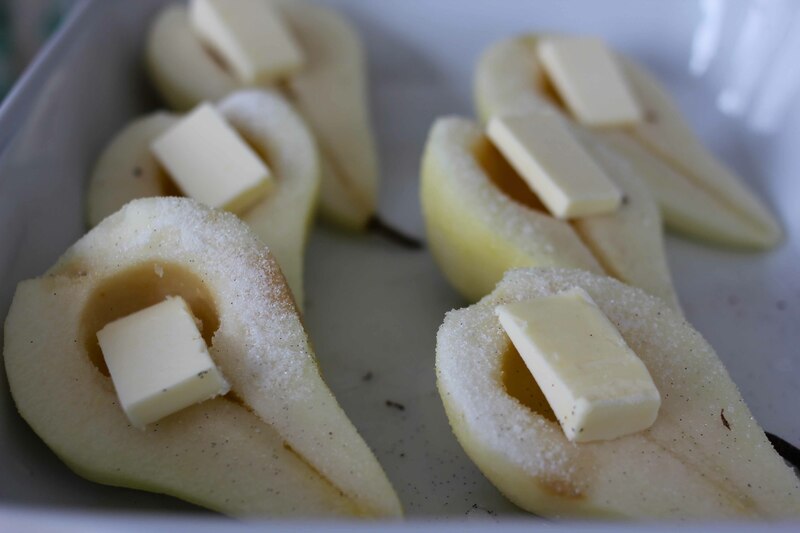 Arrange the pears in a large baking dish, with the cut-side up. Drizzle the lemon juice evenly over the fruit, then sprinkle evenly with the vanilla sugar. Nestle the vanilla pod among the fruit (again as Deb recommended I split the halves of the bean again into halves, thus making 4 skinny quarter strips – more vanilla goodness to go around). Pour the water into the dish. 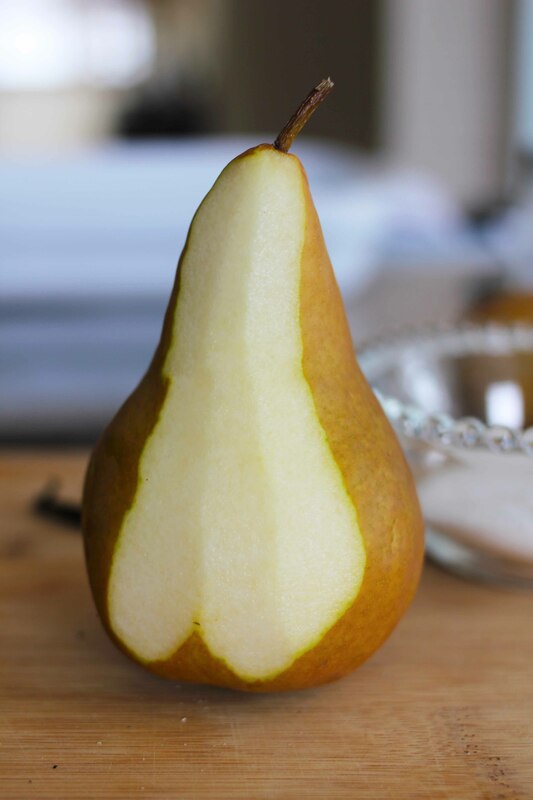 Dot each pear with some butter. 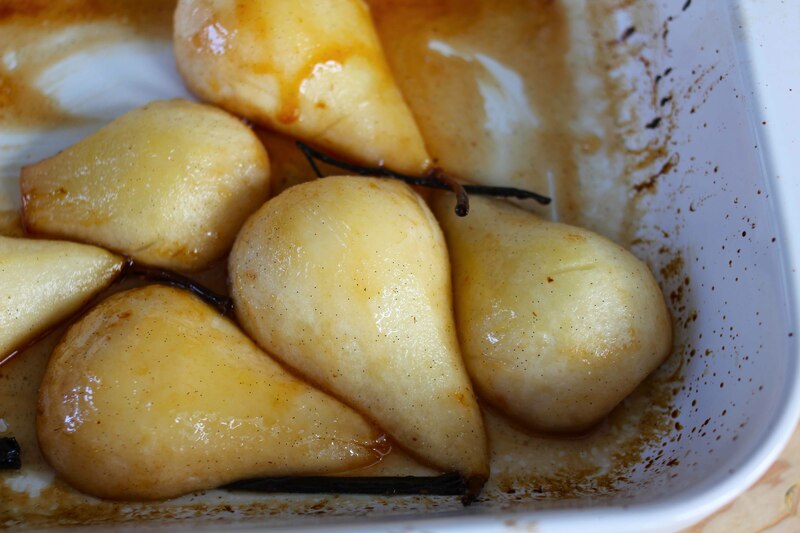 Roast the pears 30 minutes, brushing them occasionally with the pan juices. 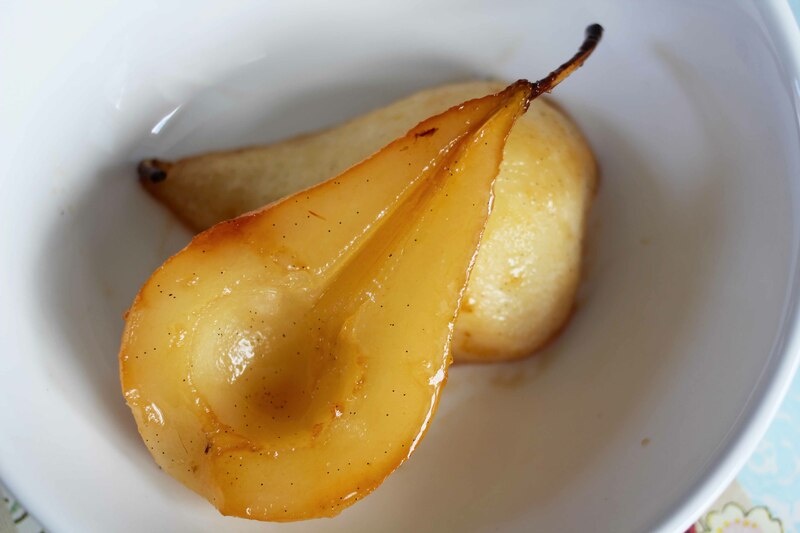 Turn the pears over and continue roasting, basting once or twice, until tender and caramelized, 25 to 30 minutes longer (if the pears are small, test for doneness after 35 or 40 minutes of cooking; a paring knife poked into the thickest part of one should meet with no resistance). 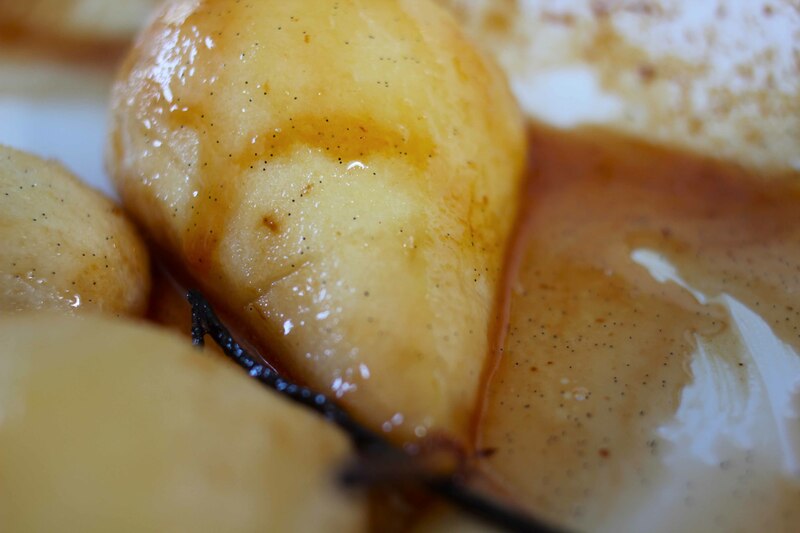 Be sure to keep an eye on them if the thickened caramelly juices are looking golden brown; the sugar will cause it to burn quickly, and trust me – you want all of that pear caramel to be edible and not burnt. It’s outrageous. Serve the pears warm, with a dollop of whipped cream, a scoop of ice cream (I had some homemade salted caramel ice cream which was *so* good), or a spoonful of mascarpone cheese. The pears will keep, covered and refrigerated, for a couple of days. We chopped up the leftovers and stirred them into oatmeal with a pinch of brown sugar, which was divine. 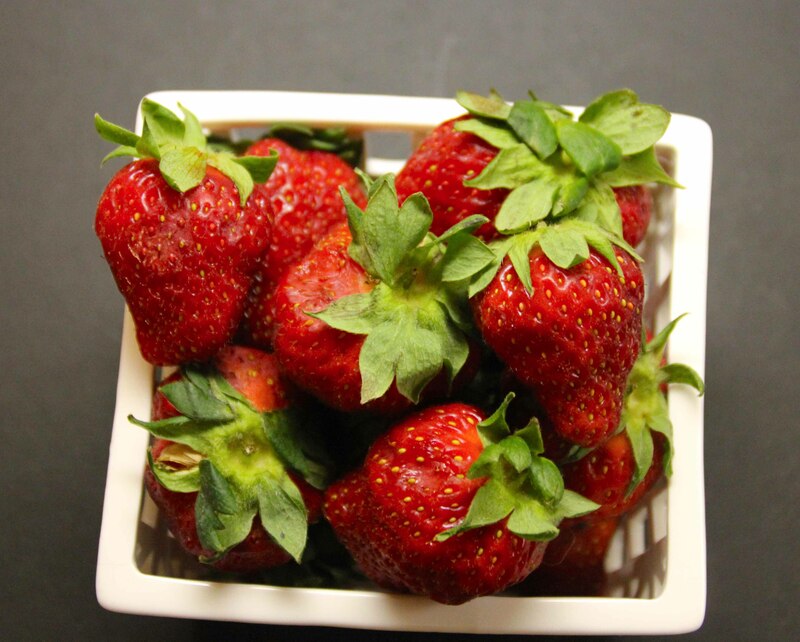 I paid $9 for a pint of strawberries last weekend. Yes. You read that right. Ninedollars. For someone that has always insisted that she’s very principled and strong willed when it comes to paying for something that is way, egregiously overpriced – I couldn’t help myself! 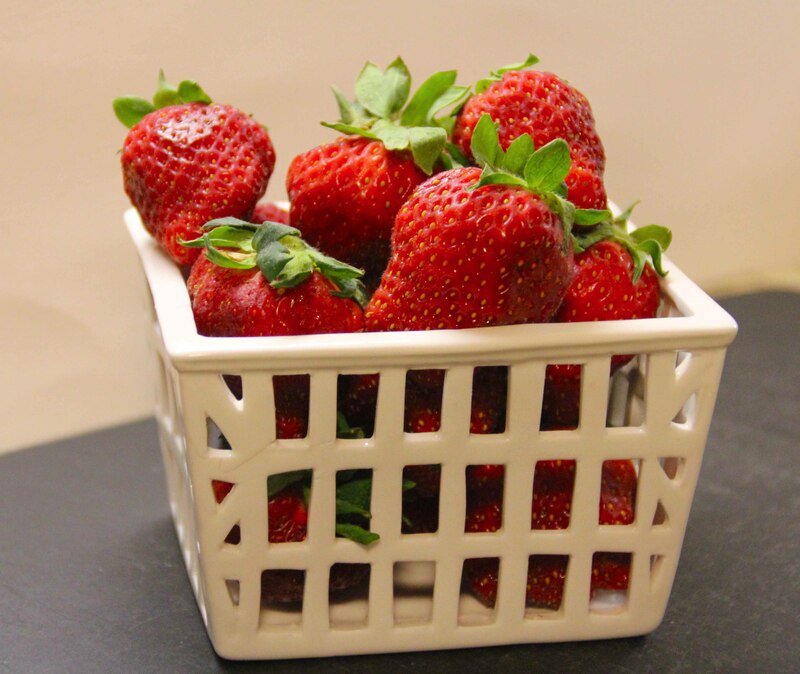 I really hadn’t even planned on buying any berries to begin with. It all started while I was strolling through the farmer’s market on Saturday looking for some leeks and some fresh fennel to go into a Spring vegetable risotto I planned on making for a dinner party that evening. Oh, Superbowl, how I love thee. Let me count the ways…. Admittedly my excitement over the matter tends to skew towards one & two above, but still I genuinely enjoy that cozy Sunday night in early February when all of America hunkers down in front of the TV to root for their favorite contender. When my beloved Patriots Ravens (a traitor I know!) are not in the running, the night tends to take on a softer, less intensely fueled attitude. As such was the case this year, we decided to skip the bar and instead have a small group of friends at our place for a mellow evening of eating, drinking, and general merriment.